It's a privilege to have someone local show you around and feed you the best local eats. A million thanks to JaeHwa and JungIn! 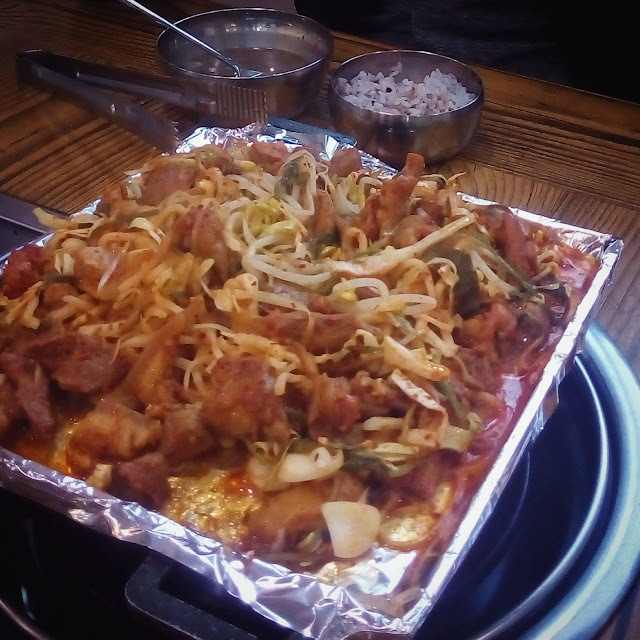 JaeHwa, who lives in Jeju City, took me and JungIn to this restaurant to try 제주흑돼지 Jeju heuk dwaeji, which is pork from a black pig. 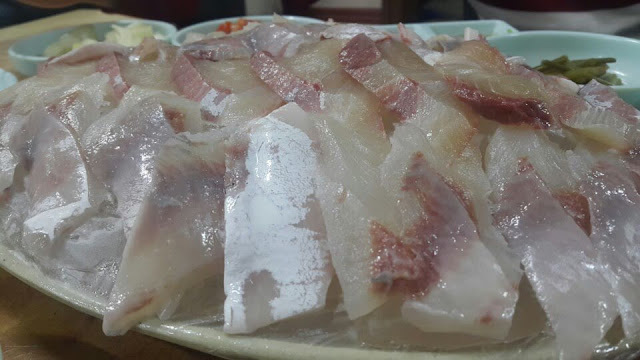 According to JungIn, who lives in Busan, this type of meat can only be had in Jeju. 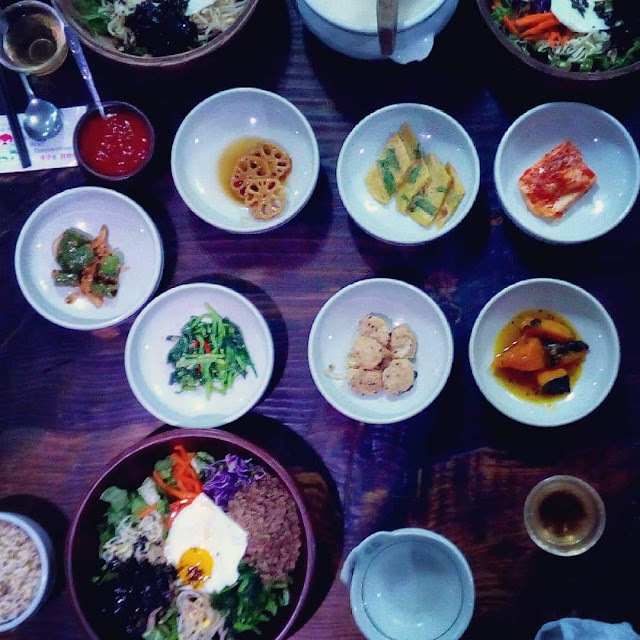 We had the 600g serving of heuk dwaeji [54,000 won] and a bowl of kimchi soup [6,000 won]. 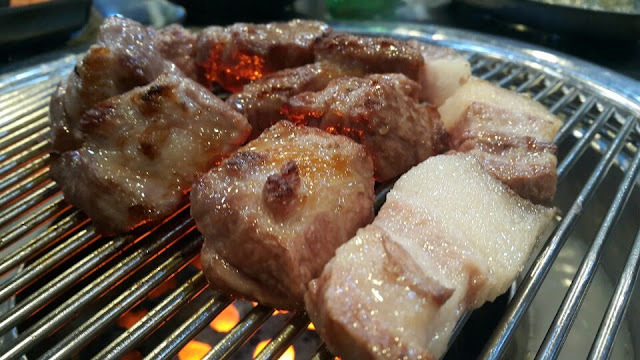 The pork is cut in pieces and grilled. There are three ways to eat the pork. 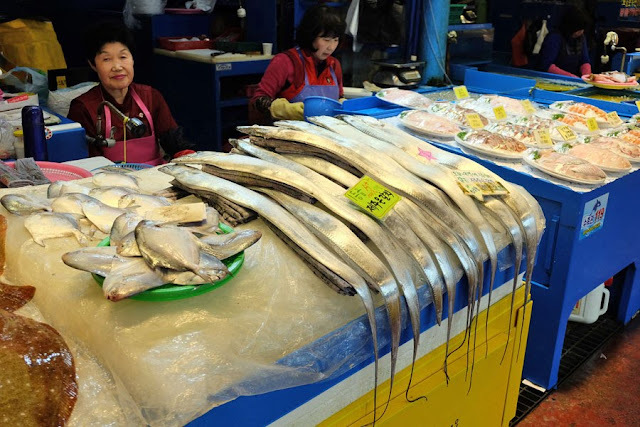 One is to dip it in the salty anchovy sauce that is heated on the grill. Another is to just dab a bit of salt on the pork. 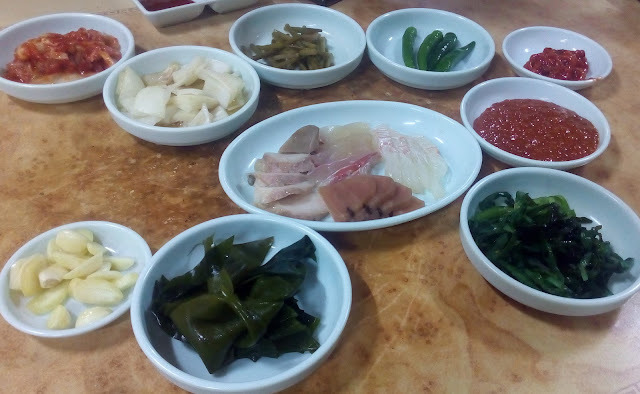 And the third way to eat heuk dwaeji, like samgyupsal and other grilled meat dishes, is to put it on a perilla leaf and add a bit of kimchi, a piece of garlic, a strip of onion. I found the pork tender and juicy but a tad too big to be eaten in one mouthful, which JaeHwa insists is the right way to eat it! This restaurant is popular with the locals as evidenced by the fully occupied tables when we visited. 더덕막걸리 dodok makgeolli [5,000 won], a local rice wine served in a bowl. I'm not a wine drinker so I can't say much about the dodok makgeolli. 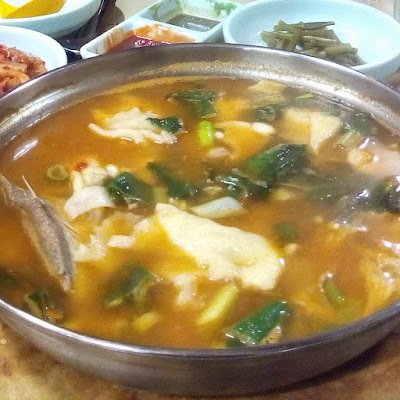 In this sashimi restaurant, we ate 사시미 sashimi [large 60,000 won] and some kind of fish soup. I am not into sashimi nor any soup with fish in it, so this was one dinner I did not really enjoy (good thing I was still full from the late lunch of gogi bibimbap). 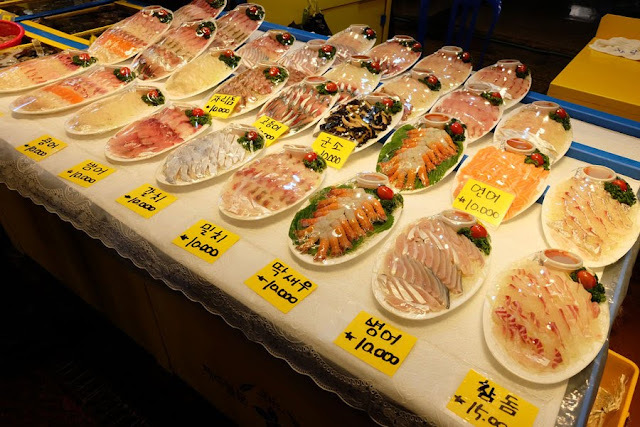 But JaeHwa and JungIn loved this and cleaned off the platter of sashimi! This is one of the meals I especially liked: a bowl of noodles in pork broth called 고기국수 gogi guksu [7,500 won]. I slurped it all—not a morsel nor a drop was left in my bowl! It was so tasty! 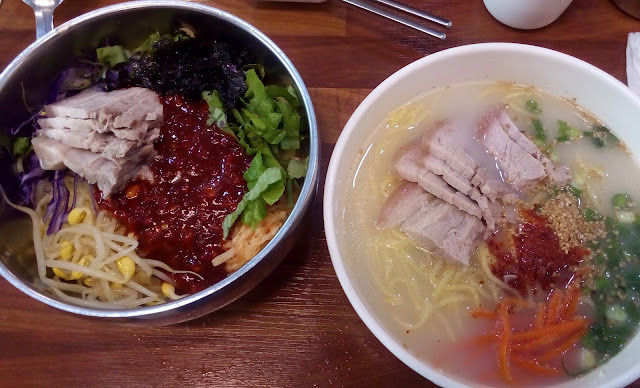 JaeHwa had the spicy mixed noodles called 비빔국수 bibim guksu [7,500 won]. I didn't try it, but it looks like bibimbap with slices of pork and with noodles instead of rice. 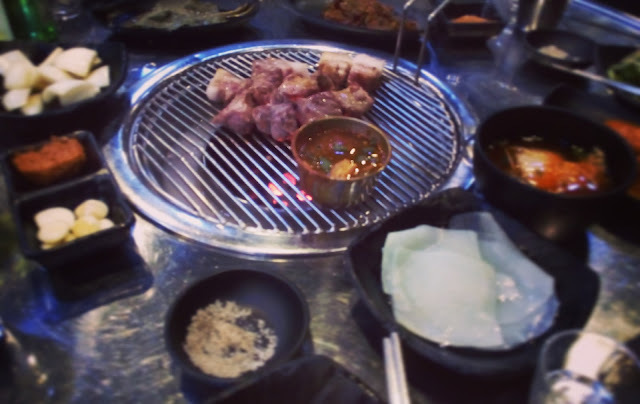 For our last dinner together, we tried 두루치기 duruchigi [7,000 won per person]. It is stir fried pork with kimchi and mung bean sprouts. The pork was tender and the sauce wasn't too spicy. The quantity was quite big that we could not finish it all. 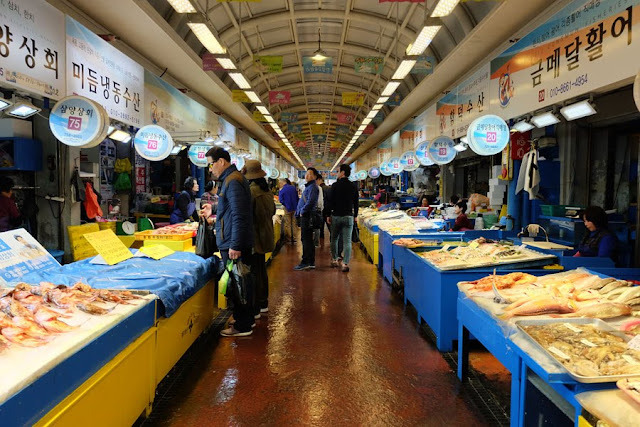 We found tons of oranges, fresh seafood, sashimi ready to be eaten, and delicacies (mostly orange flavored goodies) in Dongmun Market. 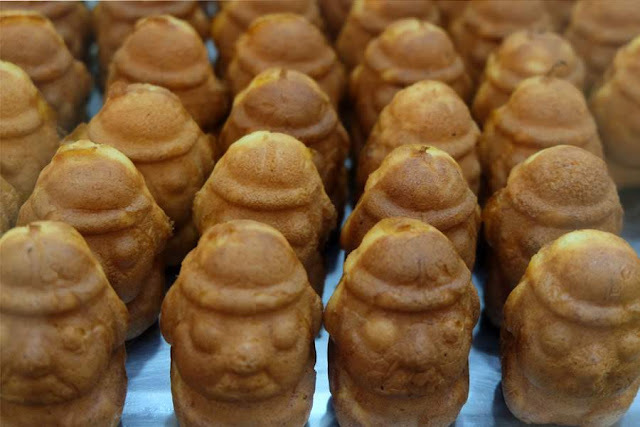 We tried a plate of 딱새우 shrimp sashimi [10,000 won], some dol hareubang (stone grandfather statue) shaped manju with orange filling (we loved this! 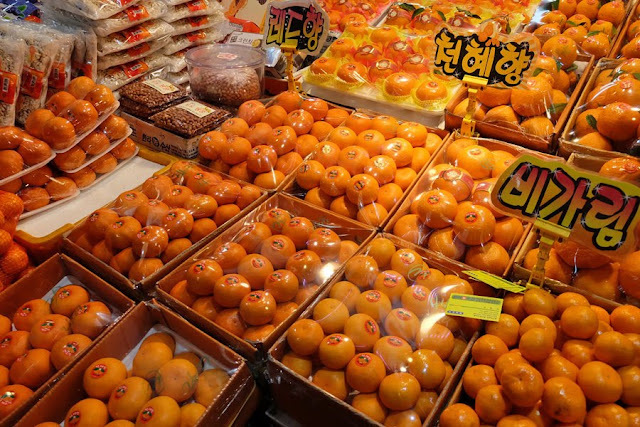 ), and some sweet seedless hallabong oranges, a specialty in Jeju. Heads up! The menu in these restaurants are in Korean! Only 국수마당, the restaurant where we had noodles, had an english translation. 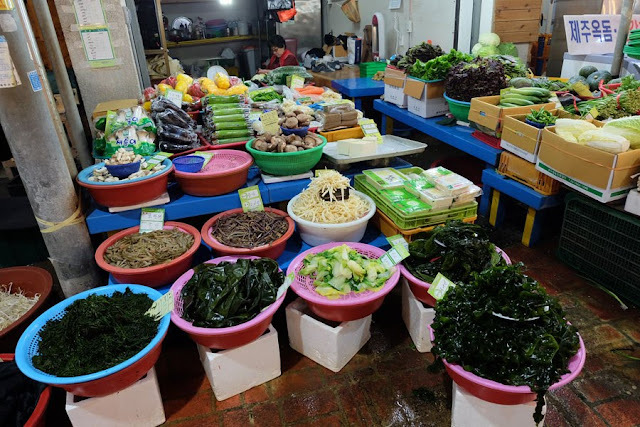 Most signs in Dongmun Market were also in Korean.